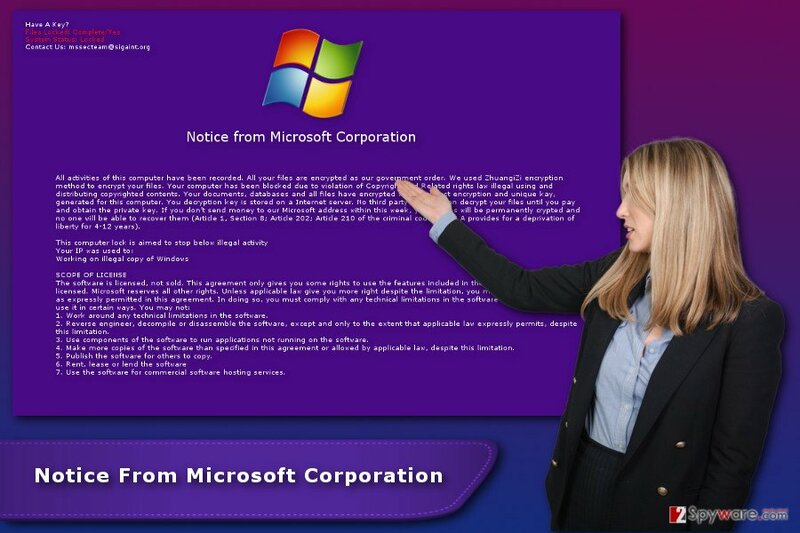 “Notice From Microsoft Corporation” ransomware uses sophisticated techniques to infiltrate computers and hide from its victims. Use Reimage to determine whether your system is infected and prevent the loss of your files. What do you need to know about "Notice From Microsoft Corporation” message? How to remove "Notice From Microsoft Corporation” ransomware? 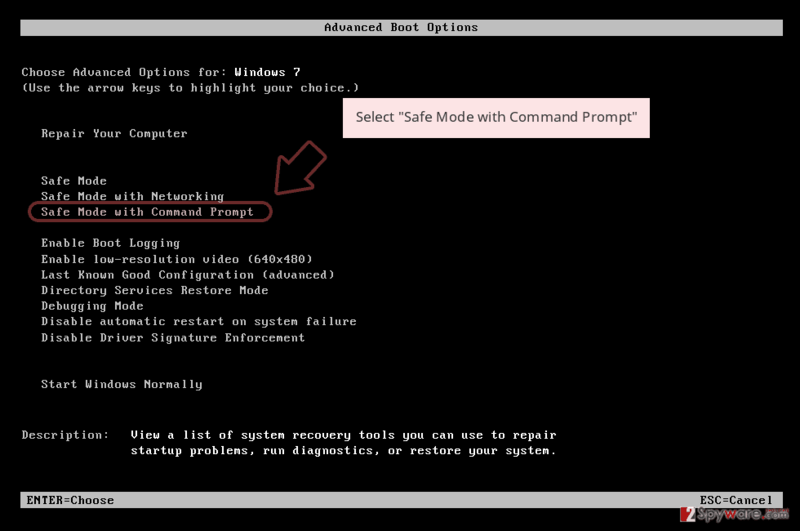 What do you need to know about “Notice From Microsoft Corporation” message? “Notice From Microsoft Corporation” virus is also known as MSSecTeam scam. This cyber infection works as a screen locker and ransomware. It means that after infiltration malware locks affected computer’s screen and encrypts targeted files. The locks screen message includes Microsoft’s credentials and informs about violating copyright laws by using or distributing particular content. In this way, cyber criminals want to convince people that it’s a real and serious issue. However, it’s just another online scam. Thus, you should not think about anything else, but “Notice From Microsoft Corporation” removal. However, cyber criminals want to make the attack even more threatening and dramatic by listing several articles of the criminal code of the United States and informs that these illegal actions might put people in jail from 4 to 12 years. However, you should not worry about spending years in prison. The purpose of “Notice From Microsoft Corporation” scam is to scare people and took their money. Thus, in situations like this, computer users should stay calm and smart. Harsh actions may lead to the money loss. As you already know, “Notice From Microsoft Corporation” ransomware also encrypts files on the affected computer. To all corrupted files it appends .Harzhuangzi file extension. According to the lock screen message, data encryption was initiated by the government’s order. What is more, attackers ask to transfer a particular sum of money to the provided Microsoft address. If they would not make a transaction with week time, all their documents, databases and others will become undecryptable. In order to rescue their data, victims are supposed to contact Microsoft’s support staff via provided email mssecteam@sigaint.org. Contacting cyber criminals is never recommended; however, in this case, it’s not necessary as well. Fortunately, the virus was not developed properly, and malware researchers managed to create a decryption software. Thus, you won’t lose all your important files. However, data recovery should be performed only when malware is deleted from the system. 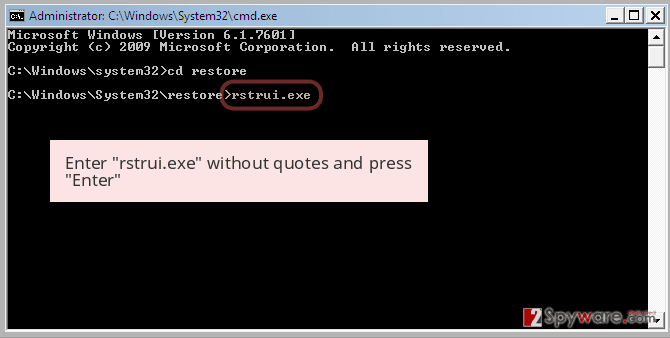 Do not hesitate and remove “Notice From Microsoft Corporation” with a help of Reimage or another security tool. "Notice From Microsoft Corporation" is a fake message that informs about violating USA laws. The malicious payload, which is responsible for executing and running “Notice From Microsoft Corporation” malware, is distributed using several methods. However, most of the time the virus gets inside the system with a help of CashBillPending(Autosaved)1.pdf.exe file, which is widely spread via malicious emails. Thus, you need to be careful with email attachments and do not rush opening them if you don’t want encounter nasty malware. What is more, this cyber infection might also infiltrate the system if you download a bogus software from file-sharing networks, torrents or other unknown online sources. Thus, in order to avoid “Notice From Microsoft Corporation” virus, you need to choose reliable sources for downloads and software updates. Also, always install freeware or shareware using Advanced/Custom settings to reject installation of suspicious third-party applications. How to remove “Notice From Microsoft Corporation” ransomware? 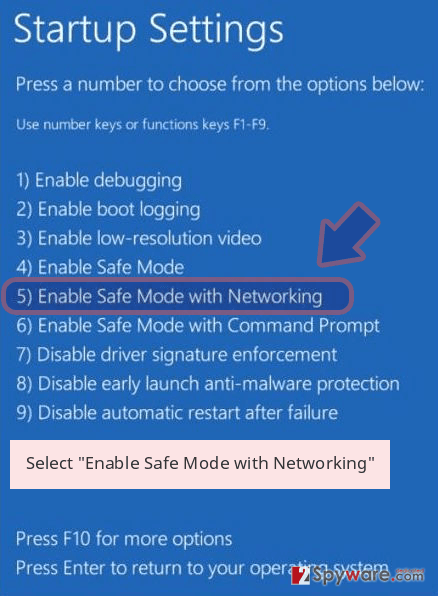 The only safe to remove “Notice From Microsoft Corporation” virus from the system is to use reputable security programs. For this task we recommend using Reimage, Malwarebytes MalwarebytesCombo Cleaner or Plumbytes Anti-MalwareMalwarebytes Malwarebytes. However, we want to point out that virus elimination won’t decrypt your files. For that, you will need to use additional software. Luckily, malware researcher Michael Gillespie managed to create decryption tool (download link) that will help you to restore corrupted data. But first, you need to perform “Notice From Microsoft Corporation” removal. 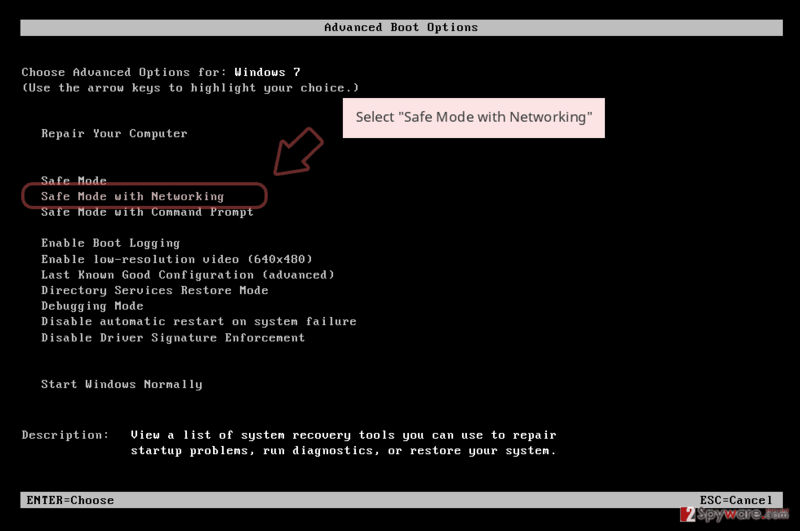 If you have problems with installing or accessing malware removal program, reboot computer to the Safe Mode with Networking. The instructions below will guide you through this process. 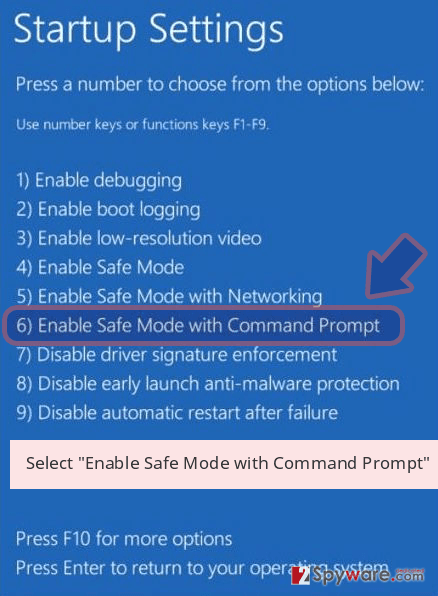 In order to disable the lock screen and perform automatic malware removal, reboot your computer to the Safe Mode as shown below. Log in to your infected account and start the browser. Download Reimage or other legitimate anti-spyware program. Update it before a full system scan and remove malicious files that belong to your ransomware and complete “Notice From Microsoft Corporation” removal. 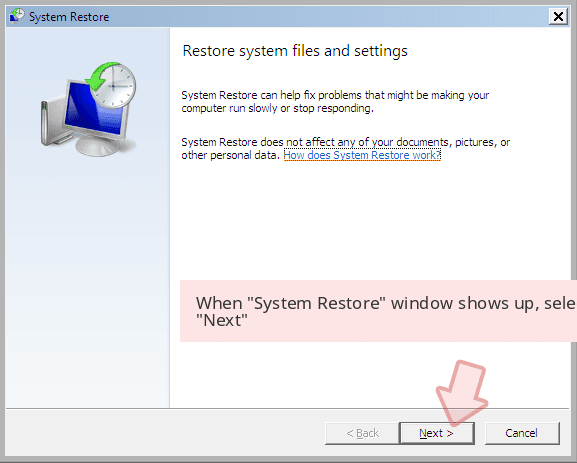 System Restore also helps to run automatic “Notice From Microsoft Corporation” removal. When a new window shows up, click Next and select your restore point that is prior the infiltration of “Notice From Microsoft Corporation”. After doing that, click Next. 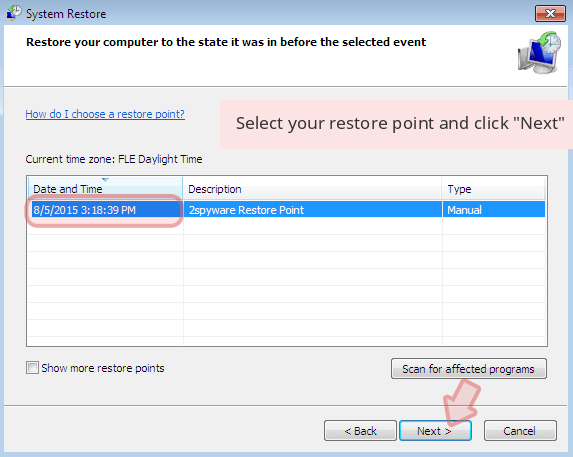 Once you restore your system to a previous date, download and scan your computer with Reimage and make sure that “Notice From Microsoft Corporation” removal is performed successfully. Guide which is presented above is supposed to help you remove “Notice From Microsoft Corporation” from your computer. To recover your encrypted files, we recommend using a detailed guide prepared by 2-spyware.com security experts. Data Recovery Pro is not a “Notice From Microsoft Corporation” decryptor. However, if the official decryption tool fails to decrypt some of the files, we recommend using this tool. ShadowExplorer might be helpful tool to restore files from Shadow Volume Copies of the encrypted files. 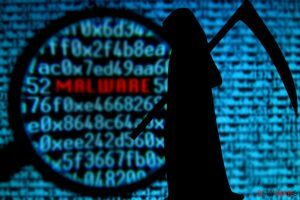 Malware researchers managed to use flaws of the ransomware and managed to create decryption software. You can download it from here. ^ Ransomware. Trend Micro. Cyber Security Solutions. ^ Michael Cottuli. Microsoft highlights tech support scams, details their “holistic approach” to problem. On MSFT. Your best source for Windows 10, Microsoft news. 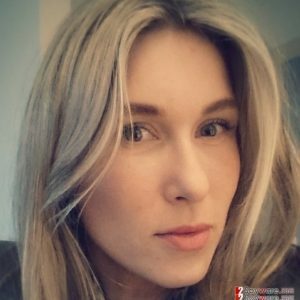 ^ How does malware infect your PC. Microsoft. Malware Protection Center. ^ How to Identify a Dangerous/Malicious Email. Optimal Networks. The website of the IT company. ^ John Machay. What Are the Dangers of Torrents?. Chron. Houston news, sports, entertainment, search and shopping from the online home of the Houston Chronicle. This entry was posted on 2017-04-06 at 02:16 and is filed under Ransomware, Viruses. You can quickly scan the QR code with your mobile device and have “Notice From Microsoft Corporation” ransomware virus manual removal instructions right in your pocket. How did you remove “Notice From Microsoft Corporation” virus?